Not all modern cars are created equal. Some are stuck in time, offering features like Apple CarPlay integration and lane-keeping as though these are new ideas. Others assume drivers and passengers are content streaming music only from their phones, and that’s it. On a recent test driving the 2018 Chrysler Pacifica on several long trips, a feature that allows you to stream video from your phone to the back-seat entertainment screens proved invaluable, especially when a few young adults were involved and I needed something to keep them busy. Streaming is not a new technology, but few current models from any automaker offer it. In fact, in tests of over 500 cars over the past few years, the feature is rare enough that it was quite surprising to see the Pacifica supports it. There are a few things to know about it, and the steps can be a bit technical, but in the end there’s an obvious reward for video enthusiasts. The first thing to know is that you will need an Android phone or tablet. There may be a way to make it work from an iPhone (using a third-party app) but with an Android device, you just run the Miracast app. 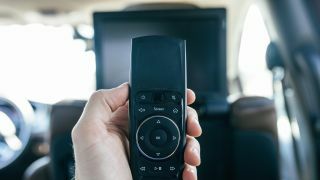 On the rear-seat entertainment screen, there’s an option to stream from a device (it’s located on the far right, after swiping through options to play a DVD or connect up using one of the USB or HDMI ports). Streaming is easier because there's no cables and no fuss. Once you start the app, you have to select the Pacifica network that connects over Wi-Fi Direct. This part can be confusing if you’re used to connecting over a normal Wi-Fi network. We tested both a Samsung Galaxy S9 Plus and Google Pixel 2 XL, and they both worked fine. We didn't see a way to stream to the driver’s touchscreen for streaming, which is probably a good thing since we’d be tempted to try it. In the rear seats, you can play any video on your phone (or really any app or game) and you’ll see a mirror on one or both 10.1-inch screen. For landscape, you have to turn your phone sideways. Both the Pixel 2 and the Galaxy S9 had no trouble streaming the Netflix show Lost in Space for several episodes. The Uconnect hotspot worked fine for most of the drive, but in an area on the fringe of the network north of a major metro, the connection causing some buffering. We used the headphones included with the Pacifica, but there’s also a 3.5mm port for any earbuds or headphones. The screens worked great in direct sunlight, and they looked clear and colorful, although we’re not talking about home television quality. And, it’s a little debatable about whether streaming to the 10.1-inch screens makes sense if you already have an Android tablet or laptop. It ended up working well in our test because you can sit back and watch the stream without having to hold a device or prop up a tablet in front of you. Plus, it’s a major differentiator as well. Since so few cars let you stream in this way to the rear seat screens, knowing you can queue up any video from your phone is handy. For parents hoping to maintain some sanity on a long trip for younger kids, it means the person next to the driver can connect up then play videos without having to sit in the back. Someday soon, cars won’t bother offering all of the alternate connection options – we won’t use HDMI or USB ports. Phones will charge wirelessly, possibly even without having to sit in a cradle. All of our content will be easily accessible in the cloud, so this feature to stream from your phone and mirror video is definitely where mobile entertainment in cars is heading. In fact, it’s becoming an expected feature – the Pacifica is running ahead of the curve. On The Road is TechRadar's regular look at the futuristic tech in today's hottest cars. John Brandon, a journalist who's been writing about cars for 12 years, puts a new car and its cutting-edge tech through the paces every week. One goal: To find out which new technologies will lead us to fully autonomous vehicles.